IBIX® lightweight, portable aluminum units feature a low pressure micro-air abrasion system that is perfect for cleaning and restoring delicate structures, historic assets and statues. Our systems are great at removing limescale from foundations, graffiti from buildings or statues and fire or soot damage. IBIX units work exceptionally well on brick, stone, marble, concrete and wood; virtually any surface can be safely cleaned and restored. IBIX is a member of the Restoration Society and works hand in hand with local Historic and Government entities to preserve our heritage for the next generation. 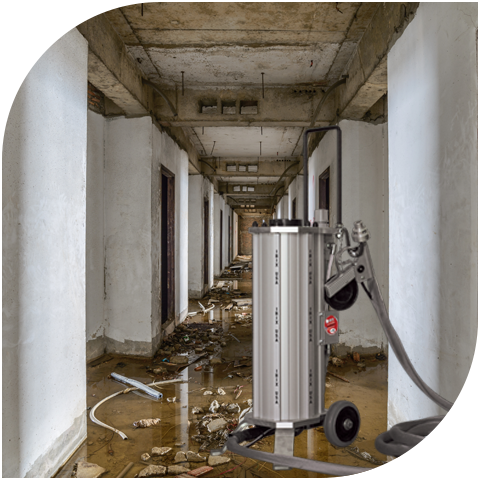 Our wet and dry micro-air abrasion systems are designed for multi-use abrasive media and are perfect for cleaning up fire and soot damage or flood and water damage. The light-weight construction of each unit is ideal for working on difficult to reach surfaces such as ceilings and attics. Optimal precision is available with our new lance which extends the blast nozzle into corners, ceilings and even crawl spaces. IBIX® units can use SODA (odor removal) or high performance abrasive GARNET (Natural mineral crystal which is low dust) for faster remediation speed cleaning.